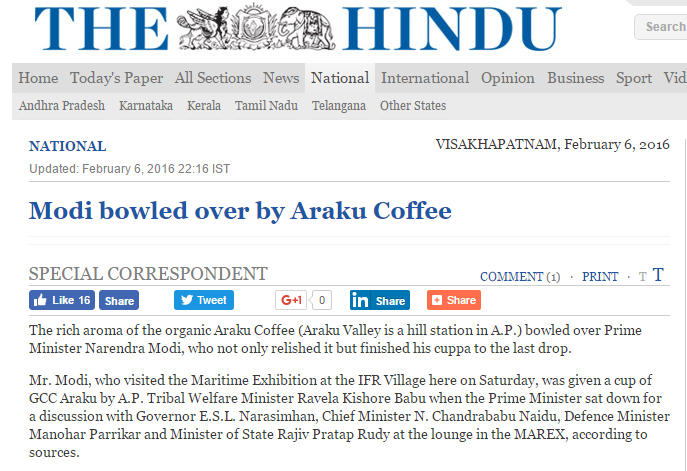 Modi himself was bowled over by the taste of ARAKU Coffee. Because of it's premium taste, most of the Coffee is exported to the European Countries. Girijan Cooperative sells the ARAKU Coffee in many authorised outlets. But they sell only Chicory added coffee. To bring the Original Coffee Flavor to every Indian, We in TRIBAL COFFEE started selling the ARAKU VALLEY COFFEE online. We buy from the farmers and deliver it to the customers. You could buy the premium coffee on Amazon, Ebay, Snapdeal and also on our Website.